“Shamrocks” are really Oxalis species. At this time of the year, ‘shamrock’ plants are sold in grocery stores, discount stores and floral shops as a decoration for St. Patrick’s Day. There really is no such thing as a shamrock plant; shamrock is just a corruption of an Irish word that means ‘little clover” and generally refers to white clover (Trifolium repens). 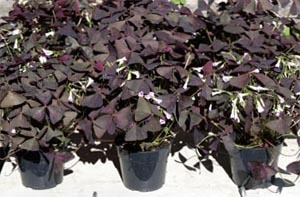 The plants marketed for this holiday are actually species of Oxalis, also known as wood sorrels, that have clover-shaped leaves. Most oxalis have leaves with 3 or 4 leaflets, but some have up to 9 divisions. The leaves come in shades of green, red, or purple, and some are patterned. The leaflets of many of these species are nyctinstic, meaning the leaflets fold up at night or on overcast days. The five-petaled flowers are borne on long stalks. Different species have white, yellow, pink or red flowers. They are unrelated to clovers even though the leaves may look very similar. Oxalis species may have green, purple or patterned leaves. When selecting oxalis plants for a seasonal decoration, choose those with lush, healthy foliage and lots of new flower buds. All Oxalis species have 5-petaled flowers on long stalks. 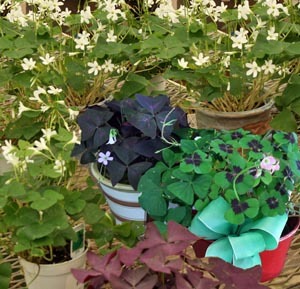 All of these Oxalis species need cool conditions, especially when in bloom, and bright light to thrive indoors. A bright sunny window where the temperature is no greater than 75ºF during the day and 15-25 degrees cooler at night is a good location. 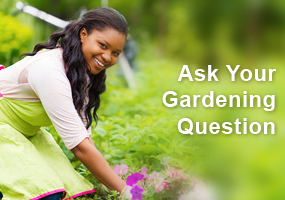 Keep the soil barely moist, but not wet. Most types cantolerate slight drying between waterings. 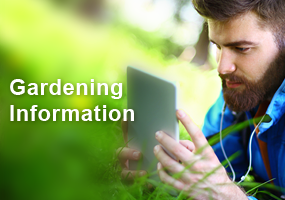 Fertilize monthly only when plants are actively growing. Oxalis have few pests, but aphids or whiteflies may occasionally infest the plants. 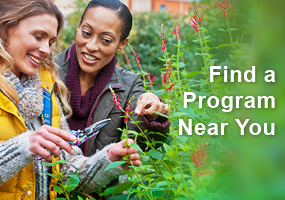 The plants will start to decline after a few months, usually during the summer. “Shamrock” Oxalis species grow from small bulbs and need a rest period. Instead of throwing the pot out, allow the plants to go into dormancy. When the leaves start to die back, stop watering and allow the leaves to dry out and turn brown. Remove the dead leaves and place the container in a cool, dark spot for 2-3 months (except the purple-leaf types, which only require about a month’s dormancy). 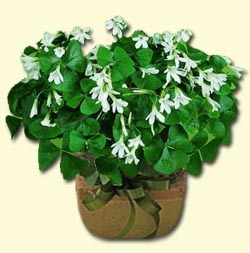 “Shamrocks” make a good houseplant or can be planted outdoors for the growing season. After this enforced rest period, move the container back to the bright window and begin watering again and fertilize. Or repot before returning the bulbs to the sunny window. Place them just under the soil surface in a well-drained soilless medium. New growth should begin to emerge soon thereafter. Oxalis are easy to propagate when dormant by dividing the many small bulbs. The bulbs separate easily and can be potted up in small groups. Although these species of Oxalis are not hardy in our area, they can be planted outside in the spring after the danger of frost has passed. Use them as an edging along a border, in containers or hanging baskets, or other places where their patterned leaves and small flowers can be appreciated. They should do well throughout the summer, but must be brought inside in the fall. 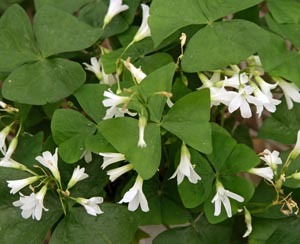 O. acetosella, wood sorrel – has green leaves with 3 triangular leaflets and white flowers. There is a variety rosea that has pink flowers. O. deppei – has 4 green leaflets with white streaks long the leaf vein and pink flowers. It is also sometimes called the Iron Cross plant or Lucky Clover. 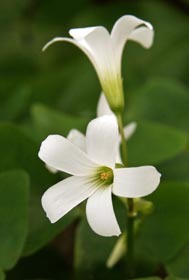 O. purpurea, Cape oxalis – has 3 dark green, diamond-shaped leaflets and white or pink flowers. O. regnelii – the leaves are dark purple or burgundy on the undersides. It grows about 8” tall and has white or red flowers. O. regnelii ‘Atropurpurea’ – a South American native with triangular leaflets and almost black-purple foliage with a dramatic V-shaped blotch in lighter purple. I planted some Iron Cross bulbs this spring and got nervous that they wouldn’t winter over here in zone 4 (maybe even zone 3 some years.) so I treated them like my Cannas, digging up, cleaning and layering with peat moss in a dark place. When plants start to decline give them a rest period. All them to go into dormancy for 2-3 months. Plants are easy to propagate by dividing the many small bulbs. I am glad that my nurse friend also gave me one of these this year. I hope I can share with some of my friends too.